You should really see this: https://act.represent.us/sign/travel_budget?source=taf . RepresentUs has a smart plan to fix our broken political system. Check it out. How many times have you booked a flight that cost more than $10,000? Probably not ever. Yet somehow members of Congress and their staff spent more than $10,000 a staggering 557 times in just one year. It’s time to demand transparency and accountability: add your name to put Congress on a travel budget. $105,000 in airfare for three House staffers on a six-day trip to Australia, Indonesia and the Philippines. $48,460.24 in transportation for two Senate staffers to visit South Africa. A total of $20 million a year total based on the latest available figures, and rising fast. What’s even worse is that the actual total could be much higher. No one actually knows how much this all costs because costs for military flights and for the American embassies who host delegations aren’t included. Furthermore, all this big spending doesn’t come out of any Congressional budget! By current law, the government – the U.S. taxpayer – picks up the check. The situation is ridiculous. Anyone who has ever traveled for work knows that they need to show receipts - but somehow Congress doesn't? We all recognize that conducting diplomacy and drumming up business for American companies requires an understanding of the world. And obviously overseas travel is important for building relationships with world leaders. But when it comes time to pay the bills, politicians and their staff members must be accountable to the public. Sign your name to demand transparency and an end to the blank check. It’s time to put Congress on a travel budget. Congress has written itself a blank check to fund its overseas travel habit. It's time to stop this abuse of the American taxpayer. Most Americans will never take a commercial flight that costs more than $10,000. But lawmakers and their staffers did just that – a staggering 557 times in just one year. We demand a full accounting for foreign trips, including the costs of military flights and expenses born by U.S. embassies. The current system is full of loopholes and the public pays the price. 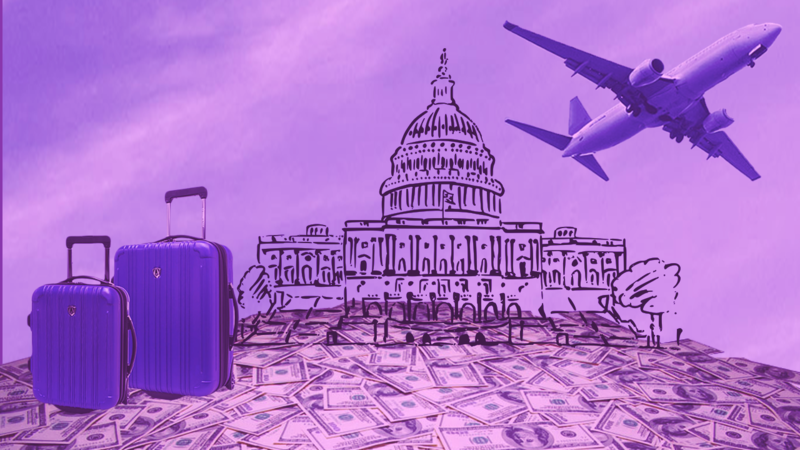 It's time to put Congress on a travel budget.